The system with the two controllers. and is same as the National Adversary from NS. The Heathkit GD-1999 is a strange system. 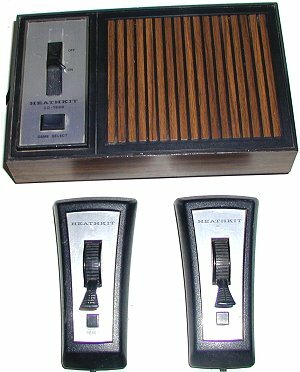 Although Heathkit was famous for selling high quality products, the GD-1999 was not a real kit. In fact, it was a clone of the National Semiconductor Adversary system (model 370), released shortly after NS launched the MM-57100 game chip in 1976. Only the labels of the unit and controllers differ between the two brands. The reason why this system is not a real kit is the assembled circuit board. Usually, the fun of assembling kits was to solder the various components on the circuti board, verify that no error was made, make the necessary wirings to the power supply, inputs and outputs, and then go through tests and adjustments. Here, nothing of that was required, as the circuit board came already assembled, adjusted and tested. Only a few solders were required to wire the controllers to the circuit board, after what it would be put into the case, which would then be screwed. This was so simple that the user manual took four double-sided A4 pages (unlike the thick 100-page manual full of illustrations and details of the GD-1380 game, which was a real kit. Talking about the electronic circuit board provided by National Semiconductor, another obscure system (supposedly a kit) was made by GEMINI (model 7640) and used the same circuit. If the Gemini 7640 was released in late 1976, the GD-1999 was released in 1977 and sold at a very low price. Not many were sold (maybe a few thousands or less: the pictured system is one of the first 800 produced).